aFrom the Department of Radiology, Hacettepe University Hospitals, Ankara, Turkey. BACKGROUND AND PURPOSE: The Pipeline Embolization Device was reported to be safe and effective in the treatment of sidewall aneurysms, preserving the patency of the vessels covered by the construct. However, to date, the safety and efficacy of this device in treating bifurcation aneurysms remains unknown. We report our preliminary experience with the use of the Pipeline Embolization Device in the management of MCA aneurysms located at the bifurcations, including mid- and long-term follow-up data. MATERIALS AND METHODS: Wide-neck MCA aneurysms, which give rise to a bifurcating or distal branch in which other endovascular techniques are thought to be unfeasible or more risky, were included. Data including demographics, aneurysm features, antiplatelet therapy, complications, and angiographic follow-up results for up to 30 months were recorded. RESULTS: Twenty-five aneurysms located at the MCA bifurcation (n = 21) or distal (n = 4) were treated. Of these, 22 were small and 3 were large. A single device was used in all but 2. No deaths occurred in the series. All patients had at least 1 control angiographic study, 21 of which were DSA (3–30 months), which showed that 12 of the rising branches were patent whereas 6 were filling in reduced caliber and 3 were occluded asymptomatically. According to the last angiographic follow-up, complete occlusion was revealed in 21 of 25 aneurysms (84%). CONCLUSIONS: The Pipeline Embolization Device provides a safe and effective treatment alternative for wide-neck MCA aneurysms that give rise to a bifurcating or distal branch when other endovascular techniques are thought to be unfeasible or more risky. The introduction of the Pipeline Embolization Device (PED) (Covidien/ev3, Irvine, California) as a dedicated flow diverter added a new dimension to this treatment strategy, with its being porous enough to preserve the patency of the branch vessels covered by the construct.9 The previous experience with the PED in the treatment of saccular aneurysms revealed that when a branch was originating directly from the aneurysm sac, this branch was kept patent when there was a flow demand through it.10 Although, to date, the safety and efficacy of this device in treating bifurcation aneurysms remains unknown. This inspired us to use the PED for treatment of MCA bifurcation or M2 aneurysms in which one of the bifurcating branches or a distal branch originate directly from the aneurysm sac, when other endovascular techniques were deemed unfeasible or more risky. There have been limited numbers of MCA aneurysms reported to be treated with the PED within different case series11⇓⇓⇓–15; however, none included bifurcation aneurysms. We report, to our knowledge, the first case series focused on the use of the PED in the management of MCA aneurysms, in which a bifurcating or a distal branch emanates directly from the aneurysm sac. Twenty-five MCA aneurysms in 21 patients (12 female and 9 male) with an average age of 56 years (range, 34–74 years) were treated with the use of the PED (On-line Table). All procedures were performed with the provision of written informed consent. This series included MCA aneurysms located at or distal to the bifurcation in which a bifurcating or distal branch emanated directly from the aneurysm sac and was treated with PED, 4 of which were included in a previous report.10 Aneurysms located at the M1 segment of the MCA were out of the scope of this report. All patients presented with headache. All aneurysms except for 1 were unruptured. One patient with bilateral MCA aneurysms had a previous treatment of her ruptured right MCA aneurysm with balloon-assisted coiling at the acute stage of SAH. This aneurysm showed recanalization at follow-up and was treated at the same session as the unruptured left MCA aneurysm treatment with the PED. There were 3 other patients who had previous treatments, as indicated in the On-line Table. Aneurysm sizes were classified as small (<1 cm), large (≥1 cm and ≤2.5 cm), and giant (>2.5 cm). The aneurysms were referred to as wide-neck when the dome/neck ratio was ≤1.5 and/or neck length was ≥4 mm. All patients were premedicated with double antiplatelet therapy and diligently investigated for sufficient level of thrombocyte inhibition before the treatment, as described previously.10 All patients received heparin to maintain an activated clotting time level elevated to 2–3 times the baseline value during the procedure. Patients who had large aneurysms received dexamethasone, with an initial dose of 8 mg given during the procedure and continued 4 × 4 mg daily for 1 week; the dose was then tapered within 1 week and discontinued. All patients were prescribed clopidogrel/ticlopidine until the 6-month follow-up angiography and discontinued after the patency of the PED was shown angiographically. Aspirin use (300 mg daily) was prescribed life-long. All procedures were performed under general anesthesia. Parent artery measurements were obtained by using both 3D and 2D images at the working projections. The PED was used as a monotherapy in all but 3 patients without any adjunctive endosaccular coils. In 3 patients who had PED placement as retreatment, 3 aneurysms had coils from the previous treatments. Among these, in 1 patient, a self-expandable stent (Enterprise, Codman & Shurtleff, Raynham, Massachusetts) was also present from the previous stent-assisted coiling treatment. All patients were designated to have a clinical and angiographic follow-up at 6 months. However, when a patient had ongoing headache or any new symptoms, 1- to 3-month angiographic control was obtained either with CTA or DSA. If the 6-month control angiography revealed incomplete aneurysmal occlusion, an additional angiographic control was performed during the 12th month and another at 18 months when necessary. A longer-term follow-up was planned for 1–2 years after demonstration of complete occlusion. This series included 25 wide-neck MCA aneurysms located at the bifurcation in 21 cases and the M2 segment in 4 cases. Of these, 22 were small and 3 were large. All devices except for 2 were placed properly, without technical difficulties. In 2 patients with bifurcation aneurysms, the distal end of the first PED moved backward during the microcatheter loading maneuver and did not cover the aneurysm neck adequately; therefore, another PED was placed distally, overlapping its proximal part with the distal portion of the first PED. Other than these cases, only 1 PED was used in all aneurysms, and a single device was used to treat 2 aneurysms located at the bifurcation with separate necks in 2 patients. In this series, there were no deaths. The only procedural complication was SAH of unknown origin revealed by DynaCT (Siemens, Erlangen, Germany) during the procedure. The patient, in whom 2 overlapping PEDs were used as described above, awakened from the anesthesia without any neurologic deficit; however, she had ischemic symptoms for several days after the procedure (rather attributed to vasospasm) and was discharged with mild right upper-extremity paresis and dysphasia. She was independent at 6 months after the treatment (mRS 1), and DSA confirmed the patency of all bifurcating branches. Other than this patient, all were discharged without any neurologic deficits. Two patients had slight left hemiparesthesia 4 weeks after surgery, after the treatment of their right MCA bifurcation aneurysms. MR imaging was obtained for both patients. In the first (patient 3), with a small aneurysm treated by use of 2 overlapping devices, MR imaging, including DWI/ADC sequences, did not show any abnormalities and CTA revealed patency of the devices as well as near-complete occlusion of the aneurysm with minimal residual filling. Additional low-molecular-weight heparin for 3 days was prescribed. In the other (patient 15), with a large aneurysm, MR imaging showed perianeurysmal edema after cessation of dexamethasone. Steroid therapy was given for an additional 2 weeks and tapered afterward. Both of these patients became asymptomatic after the additional treatments. One patient, who discontinued clopidogrel, presented with transient right hemiparesis 3 months after her left MCA bifurcation aneurysm had been treated. MR imaging showed a few acute ischemic lesions in the left frontal lobe. Immediate DSA was performed, in which significant decelerated flow of the left anterior cerebral artery A1 segment, which had been jailed with the PED during the treatment, was noted. This was the only patient in whom the proximal end of the PED construct extended back in to the ICA. The level of P2Y12 receptor blockade test was found to decrease to a value of 10%. Low-molecular-weight heparin (enoxaparin; 2 × 40 mg, 1 day) and a loading dose of clopidogrel were administered immediately. This patient did not have a neurologic deficit when she arrived at the hospital and left the hospital with the same neurologic status. The angiographic data of the follow-up examinations are given in the On-line Table. All patients had at least 1 control angiographic study. Six patients underwent an angiographic control at 1–3 months (with DSA in 2 patients and CTA in 4 patients) because of ongoing headache (n = 4) or ischemic symptoms (n = 2). Two of these aneurysms showed complete occlusion at 3 months. Others showed decreased filling. Six-month follow-up angiograms were obtained in 21 aneurysms, showing complete occlusion in 16 and significantly decreased residual filling in 3. In the remaining 2 patients, we observed the so-called “remodeled artery,” which we previously defined as the “infundibulum-like” appearance resulting from the branch coming off the parent artery with a bulking origin caused by the significant shrinkage of the aneurysm due to flow change10 (Figs 1⇓–3). The appearance of an “interruption” between the remodeled artery and the bifurcation, which we referred to as the “healing zone,” was noted in 1 of these patients (Fig 3). The 1-year angiogram that was obtained for 1 of these remodeled aneurysms showed no significant change in its appearance. However, this aneurysm showed complete occlusion at the 18-month angiogram. Two aneurysms with residual filling at 6 months showed complete occlusion in the 18-month DSA. Eight patients with 9 aneurysms underwent a long-term follow-up of more than 1 year; all showed complete occlusion. According to the last angiographic follow-up, complete occlusion was revealed in 21 aneurysms (84%; 21/25); among the remaining 4 aneurysms, the latest control angiography was performed at 1–3 months in 2 and at 6 months in 2. Occlusion process of right MCA bifurcation aneurysm. A and B, Preoperative 3D reconstruction and DSA images show the early bifurcating branch originating from the aneurysm sac. 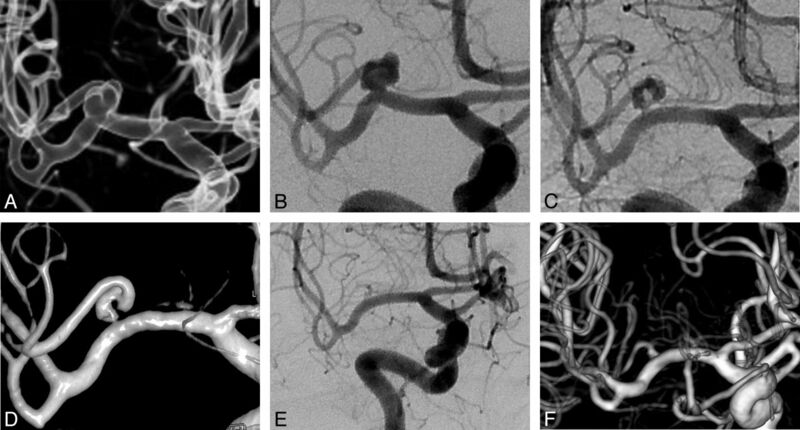 C and D, Six-month control angiogram and 3D image demonstrate the “remodeled artery.” E and F, Eighteen-month control angiogram and 3D image show the complete occlusion of the aneurysm with the bifurcating branch filling in reduced caliber. Occlusion stages of left MCA bifurcation aneurysm. A, DSA image shows the aneurysm giving rise to superior trunk. B, Fluoroscopic image shows the deployment of the PED in the inferior trunk. C and D, Early and late phases of 6-month control angiogram demonstrate the reduced and delayed filling of the aneurysm sac with the significant stagnation. Bifurcating branch is also filling belated in reduced caliber. E and F, Early and late phases of 6-month control angiogram (lateral view) show reduced filling of the superior trunk with retrograde filling of the distal branches through pial collaterals. G, One-year control angiogram demonstrates the remodeled superior trunk. The superior trunk and its branches are still filling in reduced caliber. H, Eighteen-month control angiogram shows complete occlusion of the aneurysm, with the superior trunk coming to its original size. I, Thirty-month control angiogram shows the stable occlusion of the aneurysm with the patency of the bifurcating branch (note the carotid cave aneurysm in A, treated with PED as well). Recanalized left MCA bifurcation aneurysm. A, Preoperative angiogram shows recanalization of the aneurysm previously treated by use of balloon-assisted coiling. Inferior trunk is emanating from the neck. B, Nonsubtracted image shows the PED placed within the superior trunk. C, Six-month control angiogram shows the remodeled inferior trunk (arrowhead). The “healing zone” appears as the “interruption” between the remodeled artery and bifurcation (arrow). Overall 21 aneurysms underwent at least 1 DSA control (3–30 months). Patency of PEDs as well as the branches originating from the aneurysm sacs was evaluated in all these angiograms. All PEDs were patent, with no significant intimal changes. According to the last follow-up, of the branches emanating from the aneurysm sacs, 12 were patent, whereas 6 were filling in reduced caliber and 3 were occluded asymptomatically. In 1 patient with 6-month, 1-year, and 18-month follow-up angiograms, the bifurcating branch was filling in reduced caliber at 6-month and 1-year controls. Clopidogrel was not discontinued in this patient, and the branch showed filling in normal caliber at 18 months (patient 5) (Fig 2). In 2 more patients with reduced-sized branches, clopidogrel was continued; further follow-ups are pending. The PED represents the flow-diverting device designed to exclude the aneurysm from the circulation by disrupting intra-aneurysmal flow, yet allow enough flow through the side branches as well as small perforators arising along the parent vessel covered by the construct. In an experimental study in rabbits, Kallmes et al16 demonstrated that the vessels covered by the devices remained patent at long-term follow-up. On the other hand, in a recent clinical study,17 evaluating patency of the ophthalmic artery after treatment of paraclinoid aneurysms, it was demonstrated that nearly one-quarter of ophthalmic arteries covered by PEDs underwent occlusion; however, none of these patients had visual loss. This can be explained with the abundant distal collateral supply of the ophthalmic artery from the external carotid branches. Correspondingly, in another study including 46 aneurysms in which a branch originated from the sac (excluding the ophthalmic aneurysms), only in 5 aneurysms was the originating branch (exclusively posterior communicating artery in all 5) occluded, with the ipsilateral posterior cerebral artery filling from the posterior circulation.10 Other branches such as the anterior choroidal artery stayed open, which led us to postulate that the branches through which there is a flow demand because of insufficient distal collateral supply or toward which there is enough pressure gradient between the high-pressure parent arteries, are kept patent when covered by a flow diverter. Nevertheless, our findings in this previous study emerged with the use of a single device in the treatment of each aneurysm. Limited cases in the literature reported the use of more than 1 device in the treatment of aneurysms with the coverage of perforating arteries demonstrating occlusion of the lenticulostriate branches and infarction in the related territory.11,18 In the present study, all aneurysms except for 2 were treated by use of a single PED. One of the 2 patients treated with 2 overlapping devices was admitted to the hospital in the fourth postoperative week. The MR imaging did not show any ischemic lesions, and CTA showed patency of the MCA branches, which was confirmed with 6-month control DSA. Furthermore, we prescribed low-molecular-weight heparin in addition to the antiplatelet therapy for 1 week, and the patient did not have a recurrent event. The remaining patient was the one with procedural SAH who had ischemic symptoms with unclear etiology as described above. In this series, there was 1 PED placed within a pre-existing intraluminal construct (Enterprise stent), which had been placed during the previous endosaccular coiling. Lylyk et al19 postulated in their previous study that endoluminal constructs might represent potential impediments to the efficacy of the PED. In our patient, we did not experience any technical difficulty in deploying the PED. This was the patient in whom we discovered perianeurysmal edema 4 weeks after the procedure, which we think was unrelated to the pre-existing stent and PED combination. 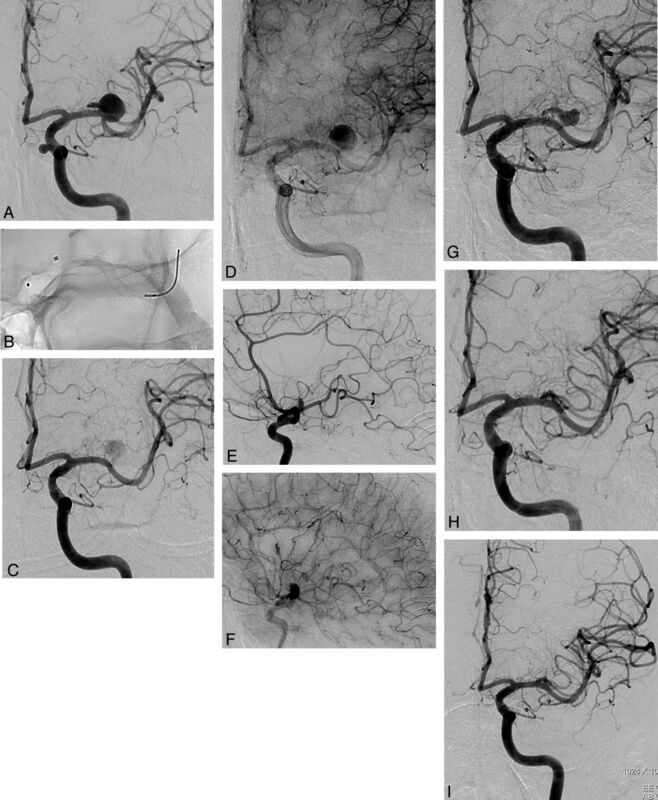 Six-month DSA control revealed complete occlusion of the aneurysm with patent bifurcating branches. The main periprocedural and postprocedural complications of the use of flow diverters in the endovascular treatment of intracranial aneurysms are hemorrhagic and thromboembolic events. Early and delayed aneurysm ruptures20⇓⇓–23 and distal ipsilateral hemorrhage10,14,24,25 have emerged as the hemorrhagic complications that are probably related to flow diversion. In this series, 1 hemorrhagic event occurred as an SAH with unknown origin during the procedure. No extravasation was observed in DSA images during the treatment; however, DynaCT revealed SAH. This bleeding may have been caused by a small, invisible dissection/wire perforation during catheterization of the MCA branch. The only thromboembolic event (presented with transient ischemic attack 3 months after the procedure) with radiologic findings in this series occurred in 1 patient as the result of cessation of the antiplatelet drugs. There was no recurrent ischemic attack after antiplatelet and anticoagulant medication as described above. This result corroborates the importance of rigorously evaluating the thrombocyte inhibition level in response to clopidogrel or ticlopidine and safety of the PED use with the coverage of perforators and bifurcating branches, at least when a single device is used. We used whole-blood impedance platelet aggregation and the rapid platelet function assay VerifyNow P2Y12 (Accumetrics, San Diego, California) in all patients and performed the procedure only if there was no resistance to the drug and the value of Verify Now test was >30%. In this series, all patients had at least 1 control angiographic study. According to the last angiographic follow-up, complete occlusion was revealed in 21 aneurysms (84%; 21/25). In our experience, we have observed that there are generally 3 phases, though not necessarily, in the occlusion process of aneurysms bearing a bifurcating branch by using the PED: 1) moderate to significant decrease in the aneurysm filling (1–3 months), 2) the infundibulum-like appearance resulting from the branch coming off the parent artery with a bulking origin caused by significant shrinkage of the aneurysm due to flow change, the so-called “remodeled artery” (3–12 months), and 3) complete occlusion (6–18 months) (Figs 1⇑–3). We recommend performing the first angiographic control at 6 months to evaluate the degree of occlusion as well as the patency of the device and the branch(es) covered by the device. When the device is patent, with cessation of clopidogrel or ticlopidine, and continuation of aspirin monotherapy, 18-month follow-up can be scheduled. According to the last follow-up, 12 of the branches originating from the aneurysms were patent, whereas 6 were filling in reduced caliber and 3 were occluded asymptomatically. In 1 patient, the bifurcating branch was filling in reduced caliber at 6-month and 1-year controls. Clopidogrel was not discontinued in this patient, and the branch was revealed to fill in normal caliber at 18 months (Fig 2). Our anticipation is that a branch is kept patent whenever there is a flow demand through it in the absence of rich distal collateral flow. Even so, the operator may extend the duration of dual antiplatelet treatment to 1 year or more. Endovascular treatment of wide-neck bifurcation aneurysms, especially when the bifurcating branches emanate directly from the base of the aneurysm, is still challenging. With the introduction of the Y-stent placement technique with or without endosaccular coiling,8,26,27 many of these difficult aneurysms have become amenable to treatment while preserving the parent arteries. However, in cases in which the branch has an acute angle relative to the main trunk, intra-aneurysmal maneuvers as well as exchange procedures are necessitated to catheterize this branch, increasing the risk of procedural hemorrhagic complications caused by aneurysmal rupture and wire perforation. To date, to our knowledge, this series including 21 aneurysms located at the MCA bifurcations is the first study reporting specifically the use of the PED in bifurcation aneurysms. The PED, being technically more simple and straightforward, provides a safer procedure in cases of existing acutely angled branches. The difficult branch and the aneurysm sac are not to be catheterized; therefore, hemorrhagic risks caused by catheterization as well as endosaccular embolization can be avoided. We acknowledge the limitations of our study, with the lack of longer follow-up data as well as the limited number of cases. Therefore, we do not advocate this treatment alternative for aneurysms that can be treated with conventional techniques, including clipping. However, the results of our preliminary experience of PED use in the endovascular management of challenging MCA aneurysms are encouraging, enabling the treatment of more complex aneurysms with less procedural risk. The PED provides a safe and effective solution for wide-neck MCA aneurysms located at the bifurcation or M2 segment in which 1 of the bifurcating or distal branches emanates directly from the sac and when other endovascular techniques are thought to be unfeasible or more risky. Preliminary results are promising with low complication rates as well as high angiographic occlusion with the remodeling of the emanating branch. Yet, the safe use of more than 1 device at these locations remains ambiguous. Larger series with longer-term follow-up examinations are required to show the long-term safety and durability of this treatment alternative. Disclosures: Isil Saatci—RELATED: Consulting Fee or Honorarium: Covidien/ev3. Saruhan Cekirge—RELATED: Consulting Fee or Honorarium: Covidien/ev3; UNRELATED: Consultancy: Covidien/ev3, MicroVention. Accepted after revision May 23, 2013.